How would the sky look if there was no atmosphere? Why does the sky appear red at sunrise and sunset? 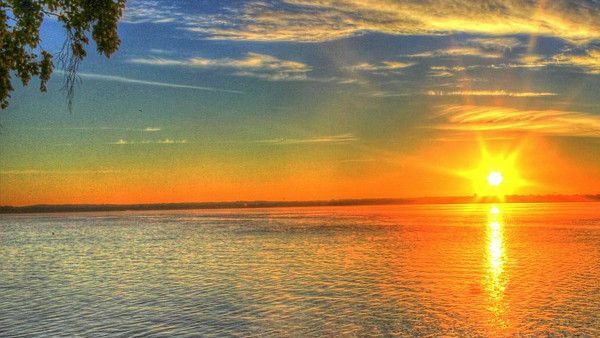 Can Rayleigh Scattering cause other colours besides red and blue in the sky? 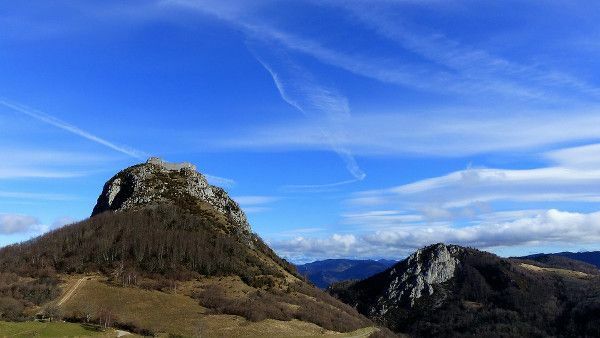 The sky appears blue because of Rayleigh1 Scattering. 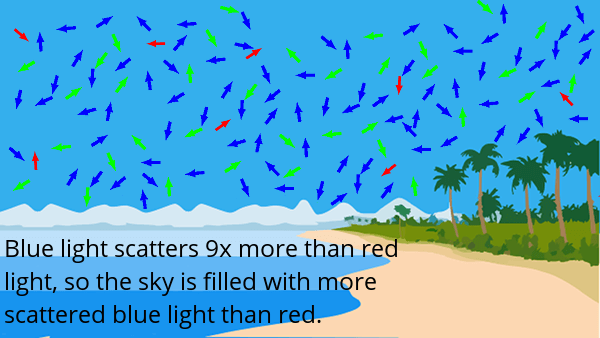 Rayleigh Scattering occurs when light interacts with particles smaller than 1/10th of the light’s wavelength (visible light has a wavelength between ~400nm for blue light and ~700nm for red light). Any sufficiently small particles will do, but the most common will be molecules of nitrogen and oxygen (which make up about 78% and 21% of the atmosphere, respectively). The probability of scattering is inversely proportional to the 4th power of the wavelength. Since red light has a wavelength about 1.75 times longer than blue light, blue light is about 9.4 times more likely to scatter than red light. The scattering is elastic, which means that the photon of light does not gain or lose any energy – it only changes direction. Light reaching us from the sun travels in a straight line. If there was no Rayleigh Scattering, then the sky would appear black (as it does on the moon – which has no atmosphere). Because of Rayleigh Scattering, the sky is filled with scattered light – most of which is blue because it scatters the most. The sky appears reddish around sunrise and sunset because the light has to travel a greater distance through the atmosphere. This results in much of the shorter wavelengths of light (blue and green) scattering long before they reach us, leaving only the longer red wavelengths reaching our eyes. 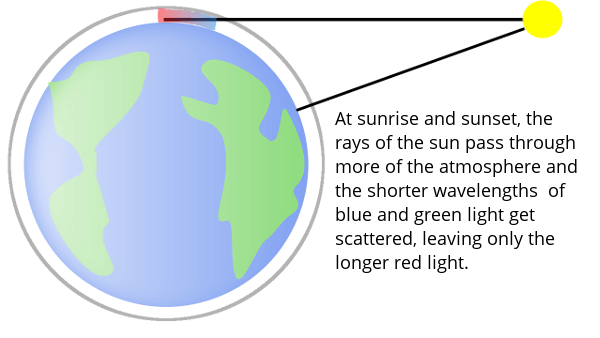 If you observe the sky very carefully during sunrise or sunset, when the top part of the sky is blue and the bottom part is red, you may observe a thin yellow and green band between them. All the colours are a result of Rayleigh Scattering. About 99% of the Earth’s atmosphere is contained between sea level and an altitude of about 30km. Above 30km, there is very little Rayleigh Scattering and the sky above appears very dark. Rayleigh Scattering still occurs in the atmosphere below and it appears blue. 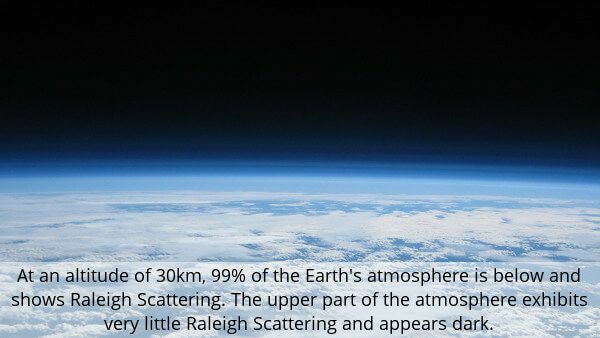 About 99% of the atmosphere is within 30km of the surface of the Earth. 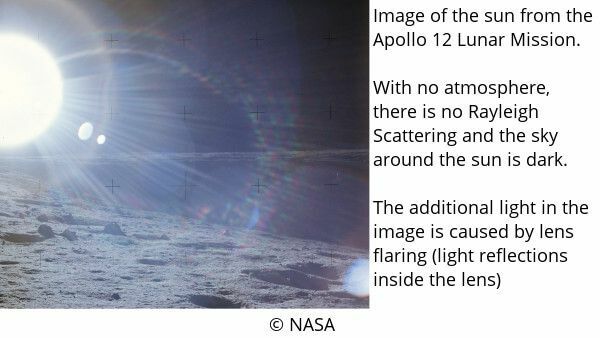 Visible light has wavelengths between 400nm and 700nm. The sky on the moon appears dark because there is no atmosphere to scatter the light. Near sunrise and sunset, you can sometimes see yellow and green in the sky.